The Saeco Intelia Deluxe is a super-automatic espresso machine that offers impressive functionality and versatility combined with ease-of-use. 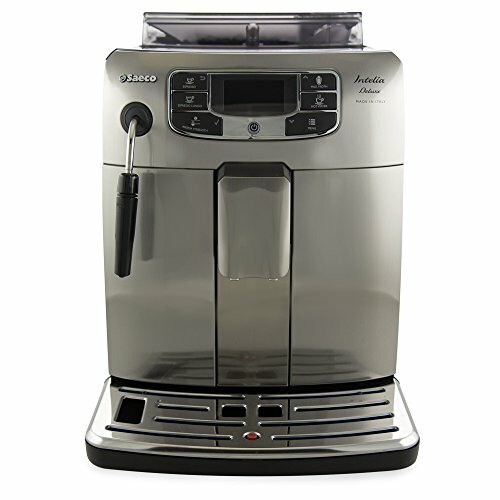 The one-touch operation lets you brew espresso, the larger espresso lungo and cappuccino. The machine features built-in high quality ceramic grinders, with 10 grind settings, and there is a by-pass doser for pre-ground coffee. There are several customizable features, including coffee strength and volume. 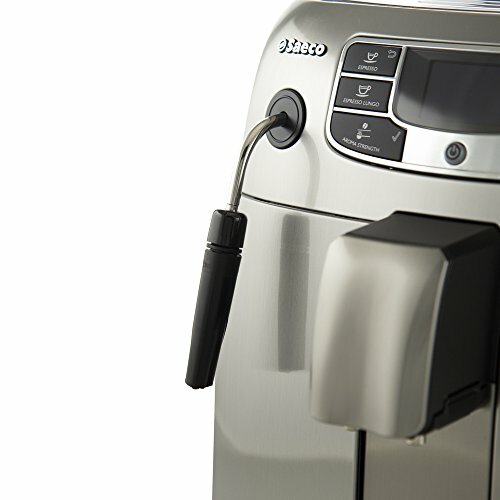 The machine features milk steaming and frothing capability via a neat front-mounted carafe. You can adjust the milk volume, but there is no separate milk wand and the milk temperature cannot be adjusted. Overall, the machine is compact and well-designed, offering a convenient way to enjoy great espresso and cappuccino in the comfort of your own home. A water filter, measuring spoon and water hardness measuring accessory are supplied with the brewer. For espresso or lungo, simply fill up the internal water tank (located behind a panel at the front of the unit), ensure there are beans in the top-filled hopper, place a cup underneath the dispensing spout and press the corresponding button. If you prefer to use pre-ground coffee, this can be added to the separate chamber which is located the top of the unit adjacent to the bean hopper. Select this option using the aroma strength button. There are 5 strength settings to choose from, which can be selected using the aroma strength button. You can also adjust the volume by holding down the espresso/lungo buttons during brewing until you achieve the desired quantity (this can be saved for future use). Adjustments can also be made to the grind settings by using the end of the supplied measuring spoon to turn the knob by notches. The grinder is clearly labeled – the smaller the dot, the smaller the grind (and the stronger the coffee). To make cappuccino, remove the hot water dispensing spout, fill the carafe with cold milk and ensure it is replaced correctly. Place a cup underneath the coffee and milk dispensing spouts. You can select to make cappuccino or to dispense just the milk foam. The milk is automatically steamed to the correct temperature and consistency before being dispensed into the waiting cup or glass. Hot water and baby cappuccino options are selected using the ‘special drinks’ menu. Brew time is about a minute, with the milk steaming process taking about 30 seconds. In terms of maintenance, the Saeco Intelia Deluxe is pretty straightforward. Before first use, the machine needs to be rinsed with fresh water. When the unit needs descaling, a ‘calc clean’ message will pop up. This basically involves flushing through descaling solution with clean water via the carafe and internal water tank. A water filter is supplied, as is a handy strip so you can find out the water hardness in your area. Once a week, the brew group requires cleaning. This can be easily removed and rinsed with fresh water. The brew group also requires lubricating after every 500 brews. Other maintenance duties include cleaning the milk carafe, which is a bit fiddly to disassemble and reassemble, but full illustrated instructions are provided. This is important to ensure no milk residue builds up in the system. The carafe itself is dishwasher safe. The drip tray slides out for ease of cleaning and the coffee grounds are collected in a drawer located at the front of the unit. The main positive of this machine is its superior functionality, which is an improvement on other good models in the range. 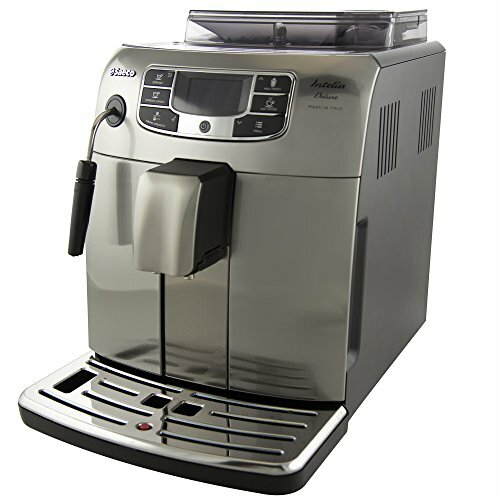 While it may take a bit of time to get to grips with the specific operation of the machine, this is basically a user-friendly brewer that allows even the novice coffee lover to easily enjoy espresso and cappuccino at home. Additional control is provided over water volume, temperature, and strength. The pre-infusion stage, adjustable grinders and by-pass doser provide added functionality that, to be fair, you would probably expect in a $1,000+ machine. This is also a smart-looking matching with classy Italian styling and attractive LCD screen. The milk carafe is front-mounted, adding to the sleek and compact design. If you have limited counter space, be aware that removing the brew group for cleaning requires accessing the right hand side of the machine. Negatives include the lack of control over the milk frothing process, with the texture and temperature fixed. As noted, milk frothing is done via a built-in carafe, rather than a steam wand, so there is no way to override the process. That being said, milk quality is good and certainly produces a fine cappuccino. It’s also worth noting that while the machine features options for espresso, lungo, cappuccino and ‘special drinks’, this latter option basically means plain hot water or plain steamed milk. Check out the latest discounts and prices here! Pros: The Saeco Intelia Deluxe features convenient one-touch functionality. The machine is versatile and simple to use, with a smart LCD screen. There is a degree of control offered with several customizable features. The milk frother produces good foam and the machine comes with quality adjustable grinders. The unit is easy to maintain with an energy-saving feature. The handsome, Italian-made design would make a stylish addition to any kitchen. 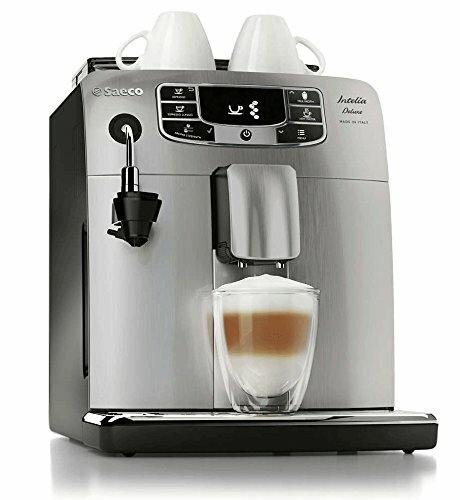 If you regularly enjoy espresso and cappuccino, this could prove a worthwhile investment. Cons: The fact the machine is super-automatic does mean a loss of control over the brewing process. Some users might also miss being able to adjust milk temperature and foam texture. Beverage options are basically limited to espresso, lungo, and cappuccino (in addition to hot water, steamed milk, and baby cappuccino). Oily beans are best avoided. In a sentence? 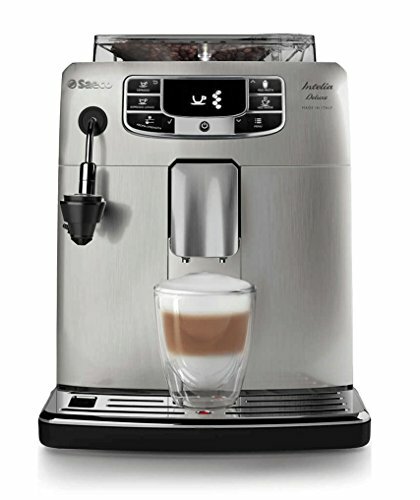 If you’re looking for a quality automatic espresso machine for $1,500 (or less), the Saeco Intelia Deluxe is certainly one to consider – while it does have a few minor negatives, on the whole, this would be a good investment for anyone who wants to make quality espresso and cappuccino at home. Overall, while this is an impressive super automatic espresso machine, there are a few issues to consider before parting with your cash. Firstly, while the machine offers adjustable options on the coffee side, these don’t extend to the milk side, which some budding home baristas might find limiting. In addition, it’s worth reiterating that this is a fully automatic espresso machine, which is great from an efficiency point-of-view, but less so from a flexibility point-of-view. The grinder is built-in, so you can’t use it to grind for other types of brewing and there is no separate milk wand. These issues aside, if you are looking for simple functionality with no hassle but some customization of your beverage, this is a great choice.